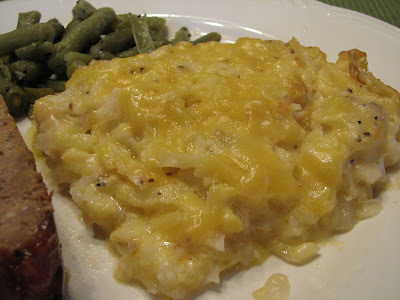 Lynda's Recipe Box: Hash Brown Potato Casserole- My daughter cooks comfort food for supper! 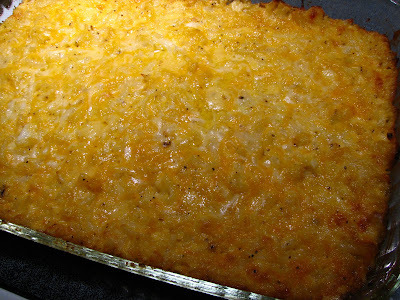 Hash Brown Potato Casserole- My daughter cooks comfort food for supper! Yesterday, during our snowy on slot of a nasty winter storm, my daughter remarked that she was craving comfort food and asked if she could cook dinner. Of course I said yes! With the promise of a delicious home-cooked meal, her boyfriend braved the snowy elements and made his way to our home in time for supper too. So, my daughter made Classic Meatloaf, green beans and this Hash Brown Potato Casserole. She also baked Neiman Marcus Cookies for a sweet after dinner treat. She did a great job, and I didn't have to cook as she always runs me out of the kitchen. I'm sure many of you have a similar old recipe for Hash Brown Potato Casserole. One of these days I'm going to redo the recipe to get rid of the canned soup, but this is one of my daughter's favorites, so I let her do it her way. She did a fantastic job! Here's the recipe. Preheat oven to 350 degrees. Mix the thawed hash browns with the rest of the ingredients in a large bowl and pour into a greased 9x13 baking dish. Sprinkle with extra cheese, or Panko. Bake for 45-50 minutes, until bubbly and golden around the edges. This casserole can be prepared a day ahead and baked before you want to serve it. It also reheats well for leftovers. Enjoy! NOTE: You can use 1 1/2 cups of the shredded cheese in the casserole, and use the remaining 1/2 cup for the topping. Oh yes, we have made many of these over the years! With the shredded, and cubed hash browns, with cream of mushroom and any other creamed soup. I would love to hear your revised recipe when you come up with it. What a nice home cooked comfort food meal you all had, wish I was there! I love hashbrown casserole - it is in the top 5 of my all time favorite comfort food! wow... showing off for the boyfriend, or does she do this often?? Very comforting and delicious dish! Your daughter did a great job! How heavenly to eat something you didn't cook yourself! When we first got married, my husband would make a similar recipe for dinner at least once a week. It was the very epitome of comfort food. What a great job your daughter did! It looks terrific...please send some my way! Say what you will, you cannot beat a good frozen hashbrown casserole with canned soup. It is indeed comfort food. Hope your snow is gone now and spring is showing her lovely face. Are You Serving Easter Brunch? It's Supposed to be Spring!